We train and support people to make and share their own films in techniques known as Digital Storytelling and Participatory Video. 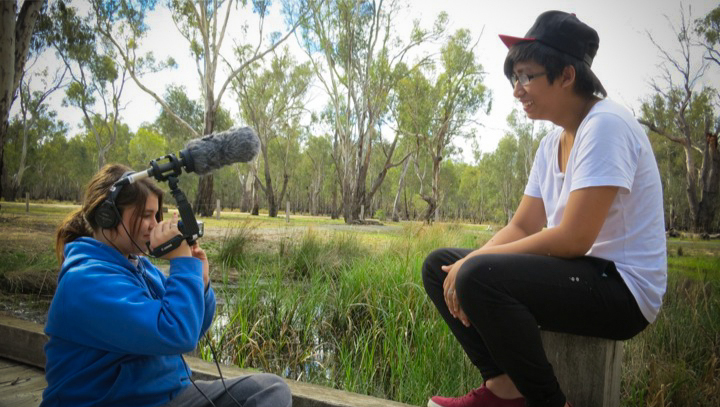 This ensures skills can stay with communities, so they can keep making their own films. We also make our own video documentaries, however always prefer to still have communities involved in at least the concept development and reviewing stages. A Digital Storytelling workshop (approx. 2-3 days) guides participants (10 max) through the telling of a personal/autobiographical story using voiceover narrative, song lyrics, photos, artwork, video, and music. Participants combine these elements through various stages in the process and are then supported to edit a short film (2-3 mins). Films may then be screened at events and online, to raise awareness, encourage social connections, promote a cause, or assess the impact of a project. Participatory Video is a set of techniques used to involve a group or community in making their own film. The idea behind Participatory Video is that making a video is easy and accessible, and is a great way of bringing people together to explore issues, voice concerns or simply to be creative and tell stories. Participatory Video is an empowering process for communities, enabling them to communicate their needs and ideas, and document their own histories. It is different to Digital Storytelling in the sense that it is not about individuals making their own personal short film, but more a group of people working together on the same film. Workshops can take place over a week or spread over a number of months. People learn filmmaking skills through a number of creative and fun activities and then develop the concept, shoot and edit their own film, all taking turns in different roles. The finished film is shown back to the community for discussion, and endorsement. We then work with participants to help screen, distribute and use their film, depending on objectives. We are also asked to produce video documentaries to promote programs and document evaluation findings, and best practice. We still like to use participatory processes where possible.